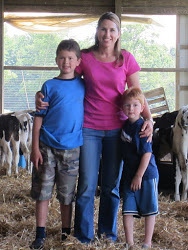 We would like to introduce The Dairy Mom Blog, by Brenda Hastings. Brenda and her family own and operate a dairy farm in northeast Ohio. She enjoys reaching out to the surrounding communities to inform and show others about everyday life on her dairy farm. Her blog post for this week debunks the myths about 'aspartame in milk' that food activists are using to scare consumers. You might have seen information last week regarding milk processors petitioning to add aspartame to milk. Most of the stories I saw were not accurate. Let’s set the record straight. Fact: Milk processors are seeking approval to use FDA approved sweeteners in flavored milk,not white milk. In 2009, the National Milk Producers Federation (NMPF) and International Dairy Foods Association (IDFA) filed a petition requesting milk processors be allowed to use safe and suitable alternatives to sugar or high-fructose corn syrup. This petition applies to flavored milks, not white milk, and the type of sugar substitutes that can be used. The reason for this request is to create flavored milk products with reduced calories and carbohydrates in an effort to promote healthy eating. There never has been, and never will be, any kind of sweetener added to white milk." Continue reading her blog: Click Here. Remember to follow her on Facebook, Twitter (@TheDairyMom), and Pinterest to stay up to speed with life on an Ohio dairy farm!